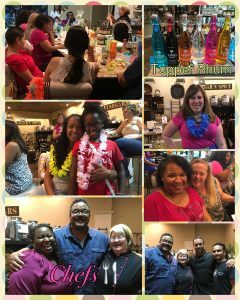 Diva Foodies was invited to a divalicious and fun tasting… Island Style! “Chef M” aka Melissa Pelkey-Hass’ menu featured original recipes which included Topper’s Rhums as the star ingredient. Topper’s Rhum is an award winning rum (or using the French spelling Rhum!) from St. Martaan. Inspired by the creativity of the tasting, I’m taking this post up a notch with interview questions sprinkled throughout. Chef M shares her steps to create a recipe with brand ingredients, tells stories of cooking with her mom and gives us links to some of her favorite recipes. 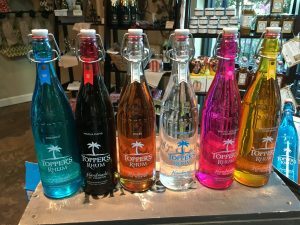 Tammy Hendrix, co-owner of Topper’s Rhum, explains how to work with a chef when creating brand ingredient recipes, why Topper’s Rhum is active in social media and shares a summer rhum drink recipe. Diva Foodies to Chef M: Let’s star with at the beginning with The Recipe. The menu you created highlighting Topper’s Rhum, for the Atlanta Food Bloggers’ Society tasting, was delicious and innovative. What steps do you take when creating a new recipe especially when you must use a specific ingredient? Melissa Pelkey-Hass, The Front Porch Gourmet: Recipe development is one of my favorite things to do. The first step is tasting the “mystery ingredient”. Unlike Chopped (Food Network), many of these ingredients are small production quantities and have a very specific blend or flavor profile. For example, Topper’s Rhum is unlike any other Rum I’ve ever tasted, so a full tasting was the first step. (Diva Foodies’ note: Good to be Chef M!) As I taste, I take notes on the flavors that are highlighted in the product and I jot down additional ingredients that I think will pair well with the product in a recipe. I also like to create things that are a little out of the ordinary. For example, although I could easily see Mocha Mama being used in a dessert, I thought it would create a fantastic mole and it did! Tasting, creativity and originality I believe are the keys to developing a delicious, unique recipe. Don’t ever be afraid to step outside of the cake box, so to speak as long as you have lots of wine and pizza delivery on speed dial, you’re golden! 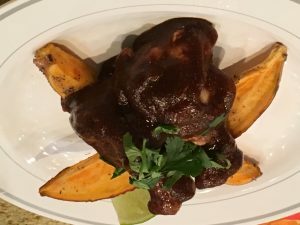 Diva Foodies: Chef M’s chicken mole wings was one of my favorites. Mole sauce is a complex Mexican ingredient that often includes chocolate. Pairing the Topper’s Chocolate Rhum added to the richness and decadence of the dish. 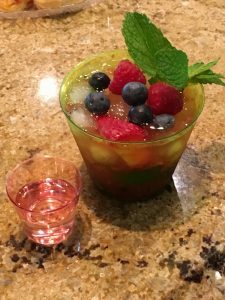 Diva Foodies/Tammy Topper’s Rhum: Topper’s Rhum’s website includes recipes to use with each rhum…smart! After tasting Chef M’s food we were curious about the risk a company takes when asking a chef to prepare a food tasking with its ingredients. When Topper’s Rhum is the highlighted ingredient in a public tasting, the brand’s reputation is dependent on the chef’s dishes. How do you mitigate risk to the brand? Tammy Hendrix, Co-Owner Topper’s Rhum: Yes, located in our brochure are a limited number of recipes, both for cocktails and frozen drinks, as well as recipes for appetizers, entrees, desserts, and dips. We are adding to this recipe list daily. Branching out into the culinary market seemed like a no brainier. Topper’s Rhum is a multi-award winning gourmet premium Rhum. How could it not be amazing in dishes? In order to decrease the risk to our brand, we must do research on potential collaborations with chefs. We make great efforts to build relationships with those chefs and mixologists that want to use Topper’s Rhum to create a unique food experience. We spend time learning about the chef, getting sample recipes, and making sure all personalities make the best fit. Diva Foodies: Chef M didn’t stop at just creating a delicious chocolate rhum inflused mole but she continued to delight us. Pairing coconut shrimp, fruited coconut rice and pineapple salsa, drizzles with rhum cream would make a lovely dish on a hot summer night. The pineapple salsa was especially refreshing and as you can see so colorful! Chef M pulled out all stops with her dessert ~ Squash Blossoms stuffed with fresh ricotta, rum soaked raspberries. She used Topper’s White Chocolate Rasberry Rhum for this one. Talk about stepping out of the cake box! Of course there were Topper’s Rhum cocktails to enjoy along the way! I loved loved loved the packaging ~ bright, beautiful, colored, glass bottles with swing top closures. Wouldn’t they look pretty on your summer table or to brighten up a dull winter dinner? 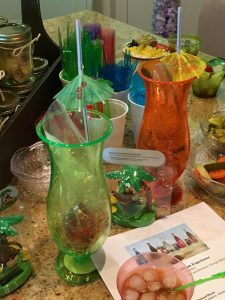 Diva Foodies/Tammy Topper’s Rhum: What is your favorite summer drink recipe? Tammy Hendrix, Co-owner Topper’s Rhum: Oh, you would ask me that. Gosh, it’s really hard to pick, but I love the Topper’s Creole Splash. Doesn’t that even sound like summer? So pretty in your hand sitting at the poolside! 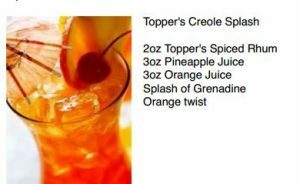 Recipe for Topper’s Creole Splash – 2oz Topper’s Spiced Rhum, 3oz Pineapple Juice, 3oz Orange Juice, Splash of Grenadine, Orange Twist, Maraschino Cherry. Pour over ice and serve. 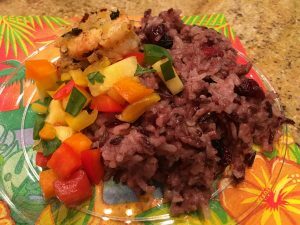 Topper’s Caribbean White is also amazing in this recipe. 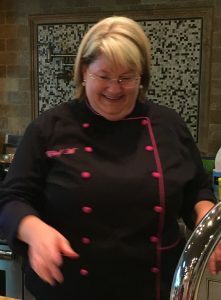 Diva Foodies/Tammy Topper’s Rhum: Since Diva Foodies is all about using social media and digital in the culinary world I had to ask Tammy this question. Topper’s Rhum is active on multiple social media channels. In a small and growing beverage company time can be a scarce resource. Why are you investing in social media and which is your favorite network? Tammy Hendrix, Co-Owner Topper’s Rhum: We are definitely in the age of social media. I don’t see how a company can reach its full potential without taking advantage of this amazing resource. We are a family owned and family run company. We all wear many hats when needed and work together to get things done. In addition, social media allows us to be most efficient with our time and our capital, both extremely important in small family owned businesses. I currently work on social media and events. As we grow, the need for more assistants will inevitably be required to handle the increased exposure. I really love all the social media outlets available. Each has its own advantage and targets different audiences. Topper’s Rhum has such a diverse following, it really requires each of those outlets to stay in touch with all of the Topper’s Rhum fans. I probably am on Twitter the most because it’s an up to the minute platform and really requires the most attention. Diva Foodies/Tammy Topper’s Rhum: Most important question! 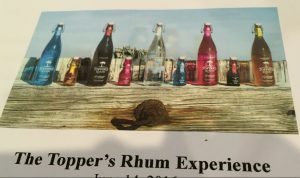 If we’re not on St. Maarten, home to Topper’s Rhum, where can consumers purchase Topper’s Rhum in the States? Tammy Hendrix, Co-Owner Topper’s Rhum: Currently, we are in 6 states in the US: SC, NC, FL, MA, RI, NV and growing. Please talk with your local liquor retailer about getting Topper’s in your state if not listed here currently. 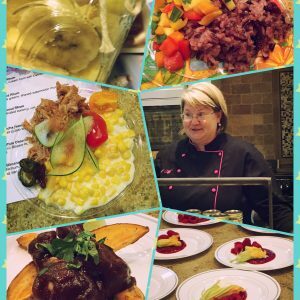 Diva Foodies/Chef M: Your culinary repertoire includes so many aspects: from recipe development, food blogging, restaurant reviews to catering, cooking classes and food competitions. I’m tired just thinking about it! Which One is your underlining passion that forms the foundation of the others and you could not live without? Why? Melissa Pelkey-Hass, The Front Porch Gourmet: The culinary classes I teach are the most special thing I do. All of the other things lend themselves to playing a vital role in the classes, but the classes themselves are my heart and anchor. When I was growing up in South Carolina, my house was always filled with people “visitin”. In those days, that’s what we did. It was like a front porch Facebook meet-up lol! My mother was an excellent cook and always made enough for the masses, especially on Sundays. She would say, “Well Missy, it’s gonna be a beautiful Sunday so we better bake an extra pound cake. There’s gonna be a lot of visitin tomorrow!” She was always spot on, and both pound cakes were devoured over hours of conversation and gallons of sweet tea. Today, when I teach, it reminds me of being on mama’s front porch and sharing my recipes with others the way she did on Sundays. Our dinners are educational, but they’re also fun, relaxed and you always walk away with a new friend or two. I love sharing my passion for cooking, I love sharing mama’s recipes and mine, and I love bringing people together through food. 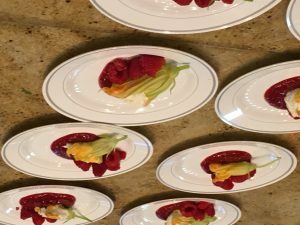 Diva Foodies/Chef M: Sweet and Savory! On your site, The Front Porch Gourmet, you share a treasure of fabulous recipes. What is a favorite sweet and a favorite savory recipe and why? Wow. Asking me to pick a favorite recipe is like asking me to pick a favorite child! LOL! There are over 400 recipes on The Front Porch to date with all sorts of things from Lemon Meringue Sweet Rolls, Coconut Layer Cakes, Blueberry Vanilla breads, to healthier options like my version of Starbucks Spinach Squares, Bison Burgers with Pimento Cheese and Oven Fried Chicken. 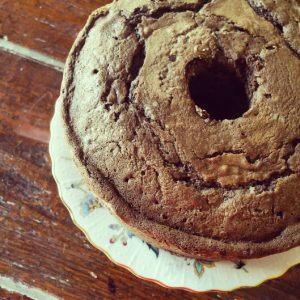 I have to say one of the most popular recipes on The Front Porch Gourmet is Mama’s Chocolate Pound Cake. This has won dozens of blue ribbons and is one of my most requested and loved recipes. Another reader favorite is my Buttercup Squash Pie. This is one of my personal favorite pies to make in the Fall. On the savory side, two of my most requested and read recipes are Chilean Sea Bass with Mango Salsa & Gingered Fennel, which by the way has sold out over 15 culinary classes in one season. Sea Bass is a beautiful, delicious thing! Let’s add Cinnamon Ribs and Collard Greens. Disclaimer: The meal including beverages was complimentary. All opinions are those of the author. What a deliciously fantastic evening! It had all the ingredients for a perfect experience! It had great people there. It had really delicious food. It had delicious boozy concoctions AND that Rhum! Never have I been able to drink rum straight. Ever. Thanks Linda! Appreciate your kind words. Yea, indeed it was a great night and such fun to see Chef M in her world!